I served this cake last weekend at a wedding shower we hosted, and I encourage you all to do the same (make this cake and host a wedding shower). Both were fun and fabulous. This recipe comes from my sister who I did not know could bake. She's a master at the grill, but for anyone that knows my oldest sister Ingri, you just don't picture her in the kitchen with an apron and an oven mit serving freshly baked scones. No, these aren't scones, but I'm trying to paint a picture. So when Ingri showed up to one of our family parties last year with this cake, the music stopped. What? Who knew? It was so $%#@ good! Not that I ever questioned her talent, but this just came out of nowhere. Everyone loved it, and has ever since. Preheat the oven to 350. Stir together the cake mix, vanilla pudding, and sugar in a large bowl. Add the remaining ingredients and mix just until combined. 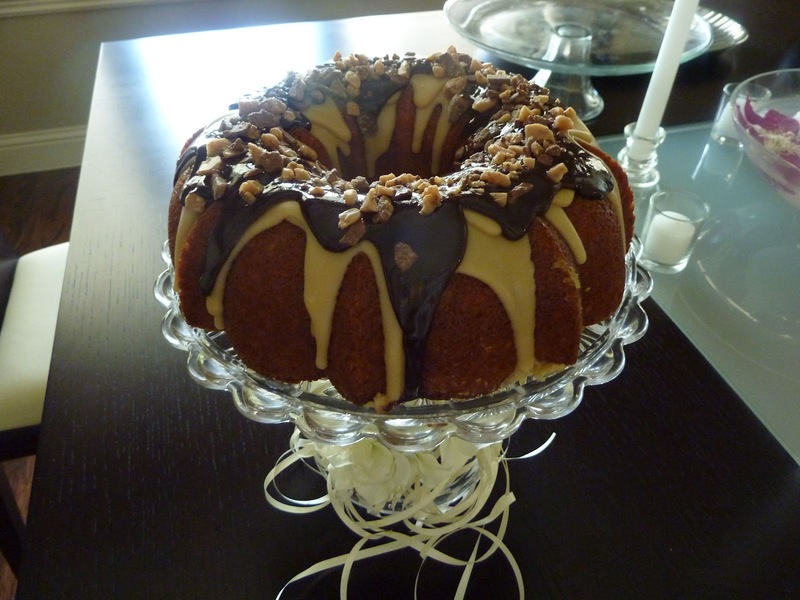 Pour into a generally greased bundt pan, and bake for 45-50 minutes, or until a toothpick comes out clean. Let the cake cool for 20 minutes in the pan, then flip it on to your decorating surface to cool completely. For the frosting, I decided to do two because I couldn't decide between caramel and chocolate. Seems logical, right? Plus then I could top it with crushed up Heath bars and call this toffee cake. This caramel frosting is amaaaaazing. I ate it years ago on a cake from Grandma Sally (not my Grandma Sally, but a good friend's Grandma Sally). After nearly 10 years, I still haven't forgotten it. Lucky for me (and you), I found the old recipe in my recipe box. I don't keep many things, but life changing recipes are one of them. Start by melting the butter over low heat in a large saucepan. Add the brown sugar and cooking for about 2 minutes, stirring constantly. Add the milk or heavy cream ( I did a combo), whisk thoroughly and bring to a low boil; and remove from heat. Let the frosting stand for a couple minutes, then add the powdered sugar. Drizzle generously over the cake. Then, take a graham cracker and make your self a caramel frosting sandwich before moving to the chocolate glaze. For the chocolate glaze, melt the chocolate chips and butter over low heat. Stir in the heavy cream and whisk until smooth. Remove the glaze from heat and let it thicken up, about 3-5 minutes or so. Drizzle over the cake, then top with toffee pieces. Of course when Ingri made this cake for us, it was around Halloween and she topped hers with paper cutouts of ghosts, bats, and tombstones...and called it Scary Hill cake. That recipe sounds a bit more like Ingri. As cute and humorous as Scary Hill cake was, I decided to keep things a little more elegant given the general tone of a wedding shower (not that Scary Hill wasn't elegant Ingri). Enjoy!